The second bill — House Bill 6851 — is also a power grab by state government. It would give a quasi-public state agency — called the Transit Corridor Development Authority (TCDA) — control over housing and commercial development around transit stops…. The bill has changed significantly since it was first introduced — for the better. Initially, the TCDA would have had the power to use eminent domain to condemn property around planned or current transit sites. As amended, the bill keeps eminent domain authority with municipal and state lawmakers. The bill also no longer has the language that municipal governments “will” comply with the TCDA. Now local authorities would delineate the land designated for transit-oriented development, then enter into an agreement with the TCDA to turn that property over. Bates considers the bill a threat to local communities and Connecticut’s tradition of home rule. I want to offer a different perspective that might explain why Governor Malloy and his supporters in the Legislature might be willing to consider what seems to be a drastic step. Transit-oriented development, or TOD, is a central pillar in Governor Malloy’s statewide transportation plan. And there have certainly been successes; the new CTFastrak busway, connecting Hartford and New Britain, has spurred redevelopment along its route, and the governor’s office has made funds available to further TOD efforts in that corridor and along the soon-to-open New Haven-Hartford-Springfield (NHHS) rail line. 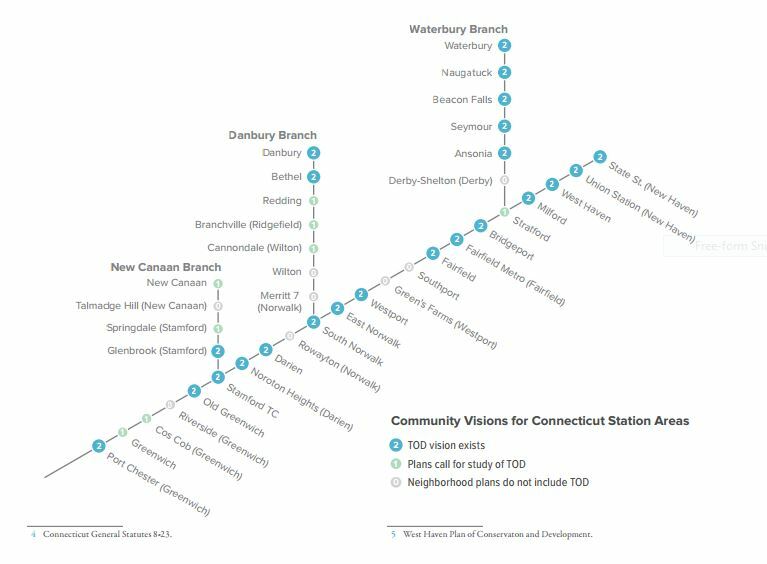 Malloy has not just pushed the state’s significant (and expensive) transit projects, but has put considerable capital, both political and fiscal, behind the state’s efforts to build TOD around the new or revamped stations. The problem is that Connecticut’s municipalities have not always been amenable to the state’s TOD strategy. A 2013 Regional Plan Association Report entitled “Halfway There” revealed that of the stations along the Metro-North New Haven Line, the state’s busiest transit corridor, only around half had (realized or envisioned) plans for mixed-use walkable development in the station area. Last year I wrote about how Meriden, whose Amtrak station will be upgraded for the NHHS service, is wasting the potential for true TOD in its downtown, planning to use a huge lot across the street from the station for a park rather than dense development. 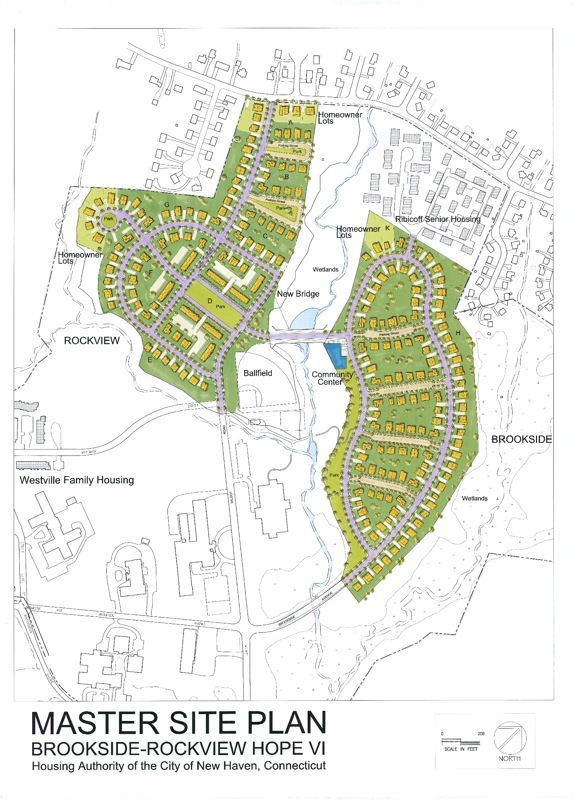 Newington, along the CTFastrak corridor, has (over the objections of its well-meaning economic development chief) considered implementing a moratorium on high-density development. Taken together, these developments–or really, lack thereof–reveal an ongoing threat to Governor Malloy’s transit- and TOD-centered agenda: the ability of individual municipalities to sabotage the state’s efforts through uncooperativeness or obstinacy. Quite simply, the ability of Connecticut’s municipalities to prevent TOD not only undermines principals of progressive development but threatens the the viability of the state’s expensive transit investments themselves. It’s a pattern that has played out repeatedly across the country: some higher level of government, be it federal, state, or regional, invests significant money and energy in building a new transit system, only to see the municipalities along the line reserve the benefits of the investment for existing residents of the area. The rhetoric may be about local control and “the character of the area,” but the realities of the movement are all too often more cynical. Pocketing the benefits of state investments in mobility while denying them to other people who may wish to relocate to the area and refusing to allow growth that will enhance the state’s investment is not only regressive; it is the kind of rent-seeking that has handicapped transit planning all across the country for years. Connecticut must do better, or its aggressive transportation investment program will largely go to waste. 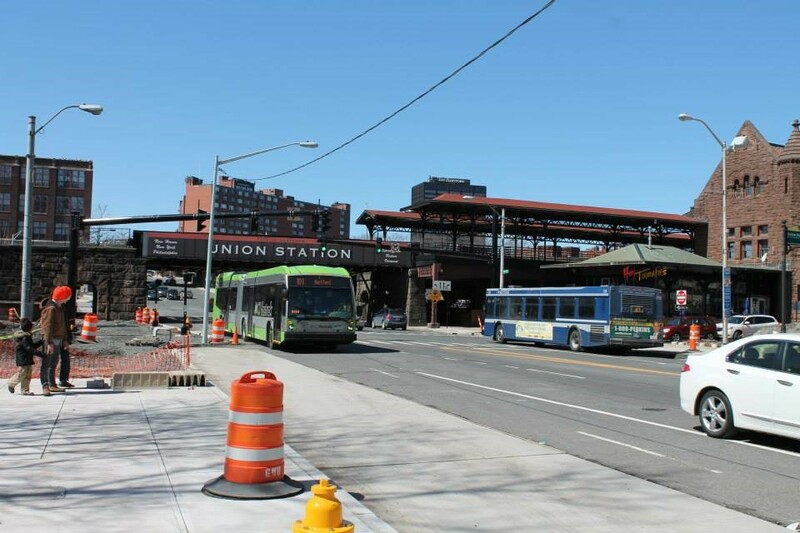 A CTFastrak bus demonstrates the state-municipality disconnect as it approaches the not-yet-complete station at Asylum Street and Union Place in Hartford, 3/29/15. The buses and busway are a state investment; the not-ready-for-opening-day downtown stations are the responsibility of the City of Hartford. Is the bill that the Malloy administration is currently pushing the right way to correct this imbalance? In truth, the bill, especially in its watered-down form, won’t make the state’s powers that much greater, since it already holds power of eminent domain. The bill would seem to exempt state-owned properties from local zoning–a major step–and would centralize parking rates in the station area in state hands, which is a no-brainer. It would also create a central administration for station areas, which could be good or bad, depending on the leadership and competence of that authority. I wonder, though, if there is a middle way forward where municipalities that are willing to voluntarily follow the principles of TOD could maintain local control so long as they meet a checklist of requirements that would allow the state to maximize its investment. I’m sure many of the larger cities would be thrilled to work with the state on that approach. It’s also worth noting that state priorities aren’t always the most progressive; the state has recently agreed to fund a second massive parking garage for New Haven’s Union Station. In the meantime, though, the Malloy-backed idea of centralizing land-use authority in station areas might represent a way forward for numerous transit systems across the country. Imagine if instead of building transit and just hoping the local municipality will do the right thing, states and authorities could go about their infrastructure business secure in the knowledge that land use will support, not sabotage, ridership potential. Stephen Smith made the argument on Friday in New York YIMBY that “Community Control is Destroying America’s Cities,” and while he may overstate the case to some extent, similar dynamics have too often played out around new transit investments. Let’s give Dannel Malloy’s efforts at state-driven TOD a shot. After all, it may be a power grab, but it’s not about abusing authority; it’s about protecting an investment from those who would waste it. That’s a principle citizens of any ideological stripe can get behind. Gentrification, of course, is all over the news. We hear about it all the time. We’ve also heard a lot about how poverty is a bigger problem for most American cities than gentrification. This latter point is undoubtedly true. But based on my experience living in and studying a couple of midsize American cities, I want to propose a middle ground–that what might otherwise be called “gentrification” in higher-demand markets in fact follows a somewhat different pattern in these cities. Last week a friend sent me a link to this interesting documentary produced by Albany’s PBS station, WMHT. Though only aired recently, the footage chronicles changes that took place on the block of Lancaster Street between Dove and Swan (“Lower Lancaster” in the film’s parlance) almost 35 years ago, in 1980-81, as filmed by a cameraman who lived on the block. The Empire State Plaza—the massive, anti-urban state office campus imposed on Albany by Nelson Rockefeller—had opened at the bottom of the block only a decade before, and its arrival had brought a wave of professional-class urban pioneers (as they repeatedly call themselves) into what had been a somewhat rundown area. The word “gentrification” gets thrown around a lot in the documentary footage, and there’s a lot of talk about the numerous lower-income tenants on the block who were then in the process of being displaced by newcomers who bought up buildings, renovated them, and rented them back out at higher price points. But is what we see in the WMHT film really what we today call “gentrification”? Clearly, the process in action on Lower Lancaster in the film involves displacement of poorer renters—some, though by no means all in this case, minorities—by wealthier (though not by any means elite), whiter new residents who mainly own their own homes. But it’s also worth considering the differences between the occurrences on Lower Lancaster and the typical American narrative about gentrification. The first thing to understand is the Center Square—a name acquired by the area relatively recently, in the postwar era—has long been one of the “elite” residential neighborhoods in Albany. The block of Lancaster in question is only two blocks from Washington Park, around which clustered the toniest homes in Albany (a truly spectacular architectural legacy to this day). The “Lower Lancaster” block itself is home to a number of gorgeous 2-3 story rowhouses, as well as the 1885 Romanesque masterpiece Wilborn Temple (built as Temple Beth Emeth), which in its day attracted the wealthiest of Albany’s German-Jewish population to the block. All that is to say that while the area around Lark Street had gone somewhat downhill by the 1930s, with many buildings being converted to downscale rooming houses, it still retained vestiges of its elite past, both socially and architecturally. 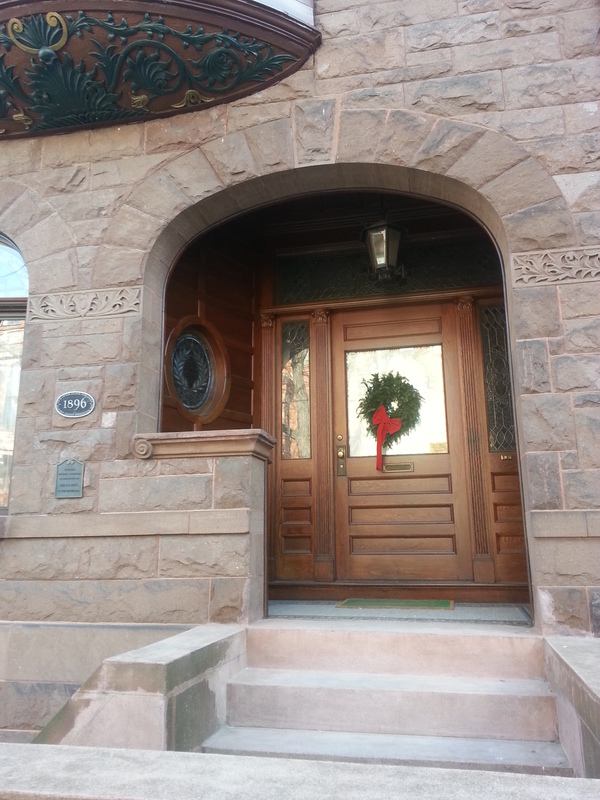 Beautifully restored woodwork on the door of a home on Lancaster Street. Lower of two plaques at left is a federal historic designation. And it was that heritage more than anything else that made the neighborhood ripe for “settlement” by professional-class types in the years after the South Mall (the original working name for the Empire State Plaza) opened. These people were attracted not solely by the proximity to the Plaza—indeed, many of them were, and continue to be, turned off by its looming presence—but by the neighborhood’s rich cultural heritage and incredible housing stock. The Empire State Plaza looms at the bottom of the “Lower Lancaster” block. The construction of the South Mall may have depressed housing prices in the next-door blocks enough to make the risk of urban pioneering worth it, but people moved into the neighborhood because they saw a potential for its return to, if not quite the same blue-blood elite status, something similar. 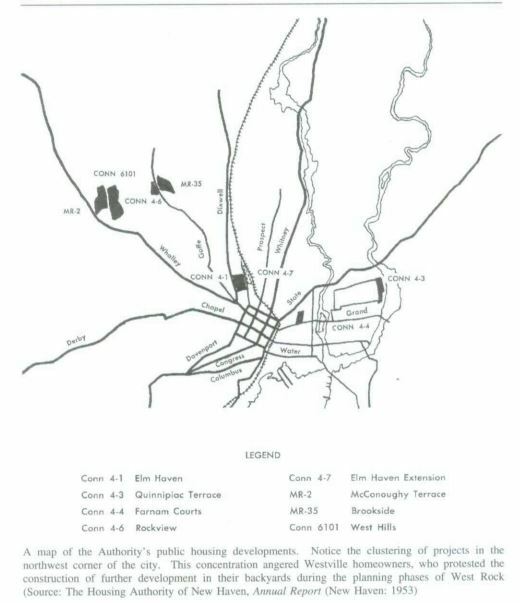 Many of the new homeowners and urban pioneers would form the nucleus of the neighborhood associations and activist groups that were able to stop the state’s plans for an amazingly destructive freeway through the heart of the neighborhood. The story of Center Square—and of that block on Lancaster—isn’t a story of a working-class neighborhood ripped apart and transformed by rapacious, profit-driven developers and wealthy outsiders. It’s the story of a neighborhood that, for better or for worse, experienced an abnormal decline in status—helped along, as in many other places, by the government’s intentional, artificial depression of urban land values—in the immediate prewar and postwar decades, and that many people labored to return to something approaching its peak status in the 1970s and ‘80s. In Center Square, it was the use of luxury housing stock by the poor, not its reclamation by the middle class, that represented an exception to the historical rule. There was, of course, incredible loss experienced in the process of gentrification. The WMHT documentary makes clear the fear of lower-income residents unsure of their next move. And the documentary preserves some truly cringeworthy moments from the gentrifiers, who proudly proclaim themselves “urban pioneers” (like the “pioneers” of the West, they were, of course, moving into land that was already occupied) and tell soon-to-be evicted residents that “it’s not up to me” and “it’s just economics.” Perhaps 30 years of exposure has taught gentrifying developers to be a little more careful around cameras, but the words here can be quite the jarring reminder of the callousness shown by many early gentrifiers. Nor, I believe, is Center Square’s experience of gentrification as renaissance rather than transformation unique. Indeed, I believe it might be better labeled part of a pattern of similar occurrences in smaller American cities. Certainly the two other neighborhoods in Albany that might be identified as “gentrified” in recent decades—Ten Broeck Triangle and the Mansion District—fit the same general pattern of being once-elite neighborhoods marked by outstanding housing stock. Neither neighborhood has been as thoroughly gentrified as Center Square, though neither (especially the Mansion District, despite its name) was as thoroughly identified with Albany’s upper crust as the area near Washington Park. Indeed, it is possible that the difference between the “gentrification” of Ten Broeck Triangle and the definite non-gentrification of neighboring Arbor Hill (despite the APA’s best efforts) is largely attributable to historic perceptions that Ten Broeck was the wealthier, more outstanding area. Since New Haven—a city of mostly similar size, age, and composition–seems to be my most frequent muse for comparisons to Albany, let’s see if the pattern holds there as well. The truth is that for the most part New Haven’s neighborhoods have stayed fairly consistent in their demographic makeup since the disastrous postwar and urban-renewal era. 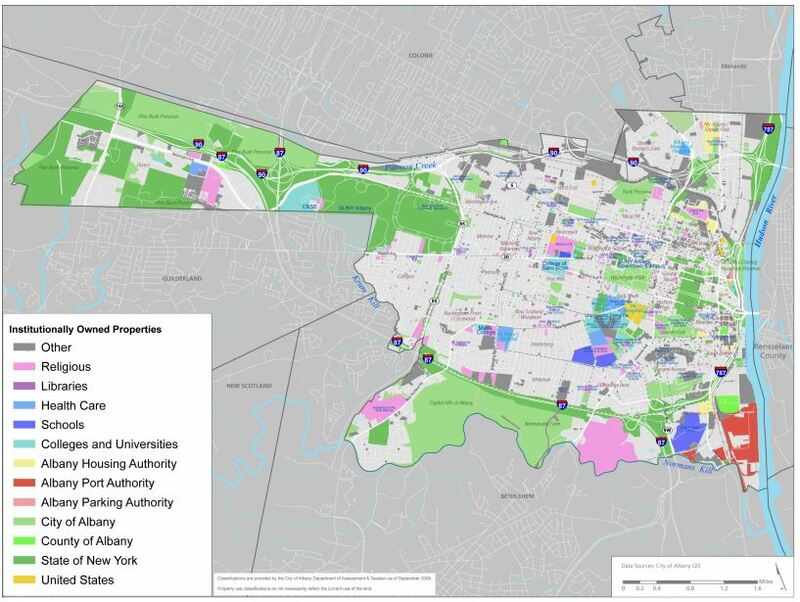 I’d say that if two New Haven neighborhoods can be identified as “gentrified” they would be the downtown-adjacent (as are Center Square, Ten Broeck Triangle, and the Mansion District) East Rock and Wooster Square. East Rock has always been one of the elite parts of the cities, long home to Yale professors; it is now a “grad ghetto” with a distinctly yuppie feel and a tight rental market by the standards of midsize cities. Like the rest of New Haven, East Rock had its struggles during the postwar era, but it never quite hit the depths of the Albany neighborhoods. 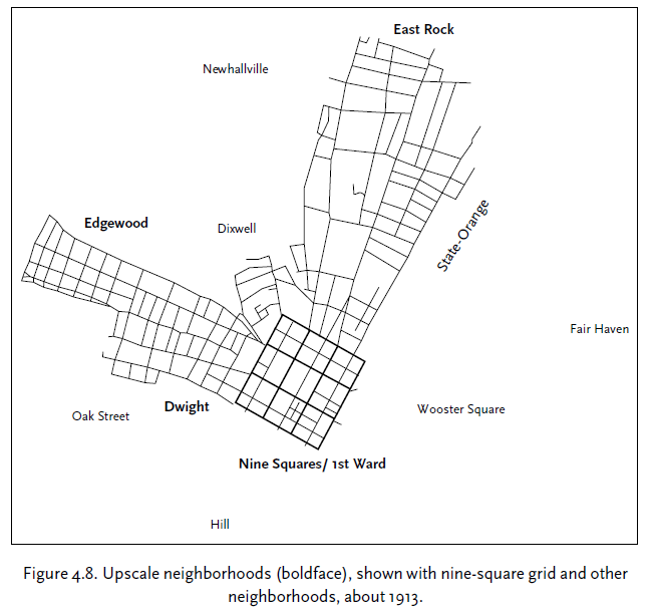 Diagram of high-status neighborhoods in New Haven in 1913, from Douglas Rae’s City. East Rock at top; Dwight at left. Wooster Square had already declined. Neither East Rock nor Wooster Square follows the pattern I laid out as neatly as do the “gentrified” neighborhoods of Albany, but they’re not that far off. The fate of the Dwight neighborhood directly west of Yale University will be a fascinating test case; formerly one of New Haven’s wealthier neighborhoods, it experienced a redlining-induced slide in the postwar years from which it has never really recovered. Dwight is showing a few signs of gentrification, sparking considerable fear among residents, but whether that process will take off has yet to be determined. What does it mean, then, that many of the cases of “gentrification” in midsize cities are in fact less a transformation of a neighborhood into something it’s never been than a revival of its former identity? I think it helps clarify a point I’ve had trouble putting into concise words for a long time, but that others have certainly talked about: American discourse—especially on the Left–has been using the word “gentrification” to talk about at least two separate, though related, processes. Process 1 is the pattern where ridiculously high demand for housing—mainly experienced in larger cities—pushes wealthier, whiter professionals into areas that have always, or virtually always, been lower-middle or working-class. The names of such cases, I’m sure, are familiar to anyone who follows urban issues: Harlem, Bed-Stuy, Red Hook, The Mission, Somerville, Humboldt Park, Boyle Heights. These cases are indicative of a housing market that is way out of whack; certainly, the desires of hipster gentrifiers for gritty “authenticity” play a part, but for the most part these neighborhoods boast neither the best convenience (Red Hook doesn’t have a subway stop!) nor the most outstanding housing stock. The impetus for gentrification is push, not pull. Process 2 is what I’ve described here as being more typical of “gentrification” in smaller cities, though it certainly describes the recent changes in many neighborhoods in larger cities as well. In this paradigm, people who we call gentrifiers are pulled to neighborhoods that have lost some of their former considerable luster. Let’s face it: generally speaking, the wealthy of the 19th century chose well. These neighborhoods have a lot to recommend them: they tend to be conveniently located and sport excellent access to downtown, green space, and other amenities. Then, of course, there is the matter of housing stock, which is solid at worst and truly outstanding in the case of the Albany neighborhoods I have highlighted. We need different words to talk about these two processes. They share many challenges that urban policymakers have to deal with—displacement of lower-income residents being the primary one—but I would argue that we can distinguish between on the grounds of desirability of their occurrence. Process 1 is a sign of a sick city (albeit one sick with success, or as Jane Jacobs said, oversuccess), and in particular of a sick housing market. It’s a symptom of inequality, bad policy, and all that entails. Process 2 is, despite the displacement and inarguable loss and pain that occurs, most likely a sign of a city that is healing itself. The days of the postwar federal gravy train are over, and cities cannot continue to exist as forced repositories of the unlucky, discriminated-against, or undesirable. Like it or not, cities need a base of upper middle class residents, even a small one, and they have to live somewhere. To some extent, the confusion in the term “gentrification” is inherent. Ruth Glass’ original definition of the term made reference only to how a neighborhood that was undergoing the process looked now, not its historic characteristics. When the term migrated across the Atlantic, it was quickly applied to areas like Philadelphia’s Society Hill: once-elite neighborhoods that had fallen upon hard times. 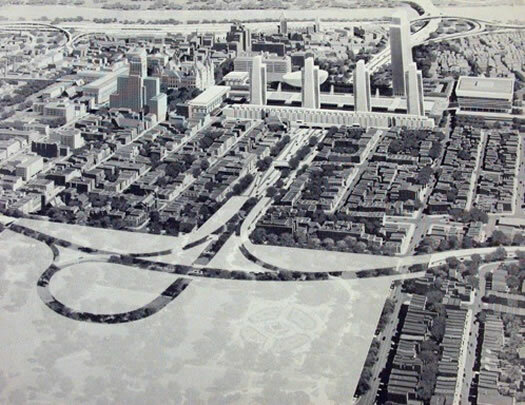 Glass’ original idea of gentrification also had connotations of a more organic process, whereas Americans tend to apply the term both to government-sponsored transformations like Society Hill and to less organized processes like what happened to Lower Lancaster Street. Our use of the term tends to ignore historical context and nuance in favor of arguments about who “owns” a particular neighborhood or area. And that’s a problem, because not all processes that involve wealthier people moving into an urban area look the same, or are the same. 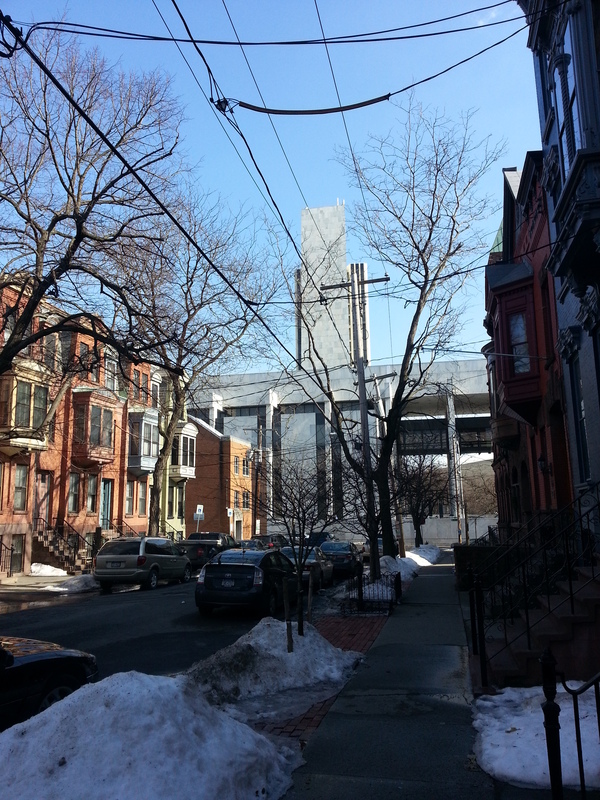 How are policymakers to respond to cries of “gentrification”? The literature on that topic is obviously voluminous, as are the feelings. That being said, I think what I have labeled “Process 2” has some lessons for us. First, the response to the challenge of gentrification should be triage. Neighborhoods that were once elite, and still have excellent convenience, amenities, and access to downtown, are almost certainly going to gentrify. The reality is that fighting that process is probably going to be a losing battle for all involved. That doesn’t mean there isn’t tremendous pain and loss of community involved—there most certainly is. But efforts should probably focus on fighting winnable battles–finding nearby affordable housing for displaced residents, leveraging new investment to create community assets, and the like–rather than trying to maintain neighborhoods in their historically exceptional stasis. Second, cities should probably plan for gentrification in once-elite neighborhoods in the medium-to-long term–even cities with housing markets that are entirely depressed at the moment. That means proactively zoning for growth, preserving affordable units, and working with landlords to prevent rising rents from displacing small businesses. It’s not news that “gentrification” as a process differs from city to city, and that in particular there’s a huge disconnect between the experiences of “hot” coastal cities and pretty much everywhere else. Nor is it news that narratives of gentrification and displacement generally lack local and historical nuance, egged on as they tend to be by Marxist-leaning academics who seek to fit every experience into one overarching paradigm. (seriously, does any field have as big a disconnect between academy and praxis as urban studies/planning?) But I hope I’ve pointed here in a direction of understanding at least one of the “other” processes that are currently occurring in American cities. I don’t know what to call it. But I do know the word “gentrification” fails to capture most of what needs to be said. It doesn’t matter if it’s freezing cold, or broiling hot, whether you can walk or have to use a wheelchair. If you want to catch a bus, you have to make your way to the intersection of Wilmot Road and Brookside Avenue, which is nearly a mile away. That was before the old West Rock housing development was razed and rebuilt with $33 million, reopening with a sparkle in December 2013. 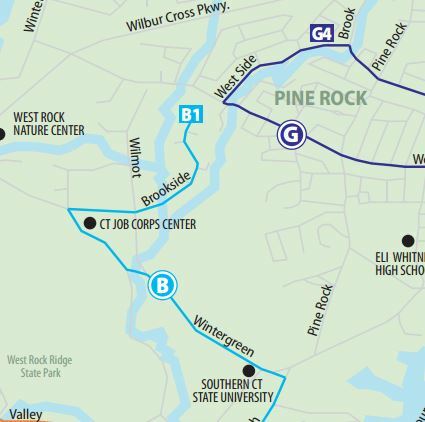 Now the residents of this pocket of West Rock have shiny new homes, but still lack one of the all important amenities that officials said they would receive as part of a master plan to revive the area: bus access. Now people need to walk seven-tenths of a mile uphill to catch a bus, seven-tenths of a mile back up to head home. To the residents facing a challenging and punishing walk to a local bus stop, the lack of bus service to Rockview seems–appropriately–like an obvious example of poor planning. That the development should re-open for residents without one of the basic components of urban life–transportation options–is indeed an affront to good planning, and, above all, to those residents. But the challenges facing Rockview residents also illustrate a broader issue within the world of planning: how to successfully integrate housing, land use, and transit, and above all how to make transit function in an environment that is fundamentally hostile to its efficient operation. The walk from Rockview to the nearest bus stop. Exhibited path is 4/10 of a mile; other homes not shown on satellite imagery are further. Rockview, Brookside, and Westville Manor were built to be “out of sight, out of mind”–to store New Haven’s needy in suburban greenery far from the grime and grit of the city’s inner neighborhood. Perhaps the outdoorsy benefits of the site were thought to outweigh its isolation; certainly, midcentury urban renewal in New Haven exhibited a fierce strain of the environmental determinism that infected renewal projects all across the country. More likely, the connection between land use and transportation needs was never considered. At that time of seemingly boundless political will, energy, and money, overcoming any obstacle–even sending buses miles out of their way to a remote development–certainly would have seemed possible. Housing Authority of New Haven developments in 1953, via Wolkoff. Brookside towards top left. It is, sadly, not an unusual story; scattered-site public or designated-affordable housing, while seemingly an attractive concept, is often later found to be sadly isolated both in terms of both social context and infrastructure needs. And so it was with the West Rock developments, which gradually slipped into decline–and then worse. But that story has been told many times over. I want to talk here about the impact that Rockview’s isolation has on CTTransit’s ability to serve it efficiently with transit, because, well, it’s not a pretty story. The West Rock area is served by the B1 variation of the B bus, the trunk route serving Whalley Avenue, one of New Haven’s main drags. 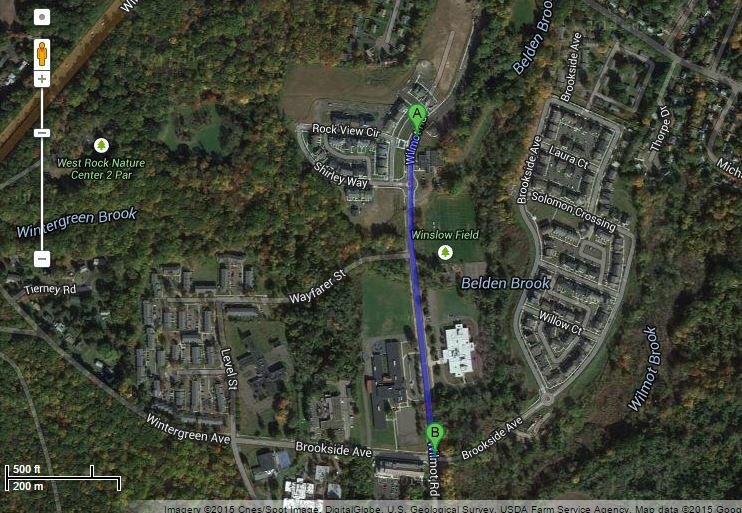 The B1 leaves Whalley at Blake Street in Westville Village (map), and meanders over to terminate in Brookside after wandering past Westville Manor and the entrance to Rockview. It doesn’t connect to the G bus (technically, the G4 variation–maybe you’re getting a sense for why New Haven’s bus system is in need of a major revision) because, well, there’s no physical connection in the street grid. When Wolkoff writes that New Haven and Hamden combined to “wall off” the new developments, he means it literally; a fence was put in along the city-suburb border to forbid passage. The fence became such a symbol of contention and rancor that when it was finally taken down last year, even the New York Times paid attention. Neither bus comes with any particular frequency; the B1 operates with widely variable 10-25 minute headways at peak hours, and 30-minute headways off-peak, while the G4 condescends to circle through Pine Rock six times per day. The problem, of course, is that it’s virtually impossible to serve such a remote development with efficient transit. Brookside and Rockview are being rebuilt to a fairly dense, New Urbanist-y standard, but they’re not big enough in and of themselves to be a major traffic generator on their own, and they’re not on the way to anything at all. Reopening the connection from Wilmot Road to Woodin Road in Hamden, and the G4 bus, is a start, but a bus that operates that infrequently is just of very little utility to residents. The B1 provides decent service to the area–probably more than ridership really justifies–but it’s a prime example of some of the drawbacks of branching; every bus that turns to serve Brookside is a bus that doesn’t serve the far denser Whalley/Amity corridor, where buses often run full at rush hour. It’s not that Brookside and Rockview don’t deserve service. It’s just that the decision to site the developments there 65 years ago, and the much more recent decision to rebuild them in place, means that every bus serving them is a bus that doesn’t serve corridors with more demand. At the same time, it’s hard to justify serving the West Rock developments frequently enough to really build ridership, so they get service at somewhat random, not all that useful intervals. In other words, Rockview’s bus problem is really an example of the coverage-ridership tradeoff. Succinctly put, this principle states that transit agencies and planners face a tradeoff in deciding how many of their resources to devote to “coverage” (trying to make sure as many geographic areas as possible have transit service, regardless of ridership potential), and how many to devote to building ridership in core areas that are likely to attract riders. A closely related phenomenon, labeled the bus complexity tradeoff by Streets.mn, is also at work here, as it is all across the New Haven bus system; a rider from downtown seeking to get to the Stop & Shop on Amity, say, could easily board a B1 rather than a B2 or B3 and wind up at Brookside, or vice versa. The coverage-ridership tradeoff means that serving Rockview and Brookside depresses ridership on core routes likely to attract more riders; the bus complexity tradeoff means that the complexity inherent in a system with as many branches–and twists and turns on those branches!–as New Haven’s is itself overwhelming and a turn-off to potential riders. The long-term challenges are more severe. Rockview’s citizens have been disadvantaged, and the political and policy leaders serving them put in a difficult place, by decisions made over half a century ago. 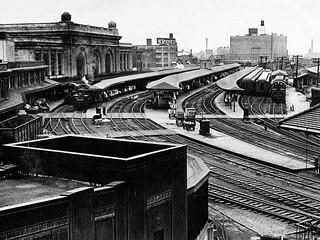 The failures of urban renewal and midcentury “rationalist” planning are myriad, but perhaps none is greater than the assumption that automobility had broken the connection between transportation and land use forever and that government would always be able to sustain rump transit service as a politically acceptable social service program. As we have learned, neither of those things was close to true. And as transit regains–through cultural shift or economic necessity–some of its past popularity, policymakers will be increasingly faced with the legacy of places like Rockview: physically isolated communities, crying out for service, but fundamentally hard to serve on a basis of rational efficiency. Rockview is a reminder of how long the planning mistakes of the past can linger, but it is also a warning for the future.